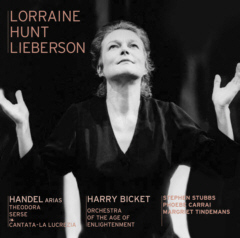 The good news is that Lorraine Hunt Lieberson has returned from her long absence looking healthy and sounding — well, I gave up trying to invent new superlatives for this supreme musician some time ago. Suffice to say that I walked out feeling heavily drugged. Peter Lieberson's new cycle Neruda Songs is dizzyingly beautiful music, and not only because LHL sings it; I'll say more when I review the composer's big new Philharmonic piece in the spring. The bad news, for music criticism at least, is that Richard Dyer, a dean of the profession, is leaving the Boston Globe in May. Read his review of Neruda Songs for a sense of what will be missed; no critic writes with more authority or passion. Will the Globe find a worthy successor? Or will it use Dyer's retirement as an excuse to edge classical music off its pages? I hope the former. The possible future that's being glimpsed in other places is that there will no longer be classical critics, only arts reporters who cover classical events from time to time. This is all in response to the ongoing slide in newspaper subscriptions. Ironically, those who remain loyal subscribers are more likely to be interested in classical music. What I don't get about the current crisis, if there is one, is why newspapers persist in giving away all their content (or nearly all, in the case of the Times) on the Internet. I never took economics, but it seems to me that a company that gives away its product for free is committing suicide. More: Several people wrote in to point out that newspapers make their money not from subscriptions but from advertising — so putting content on the Internet actually multiplies the opportunities for profit. OK, but should newspapers be so dependent on advertisers for their livelihood? They end up answering to the tastes of advertisers rather than readers. This is why classical criticism and arts coverage are being cut back even as core subscribers remain loyal to that kind of writing. Advertisers don't like classical music because it generally doesn't appeal to their coveted young-male demographic. The biggest problem in American culture right now is that woebegone demographic concept. It has begun to devour those who have long lived by it, as recent events in Hollywood show. Yet no one has the courage to break away from it. This is what we call reactionary. I'll repeat my outré contention that classical music, for all its elite trappings, is actually a radical, disruptive force in American culture, whereas most popular culture, for all its rebellious trappings, is intensely conservative.